SpongeBob: (lifts Squid’s legs off face) Oh, hey Squidward. Wat’cha doin’? Squidward: (takes window off face) What, am I doing, what are you, doing!!!? SpongeBob: I am sharpening my trusty spatula. Speaking of which, are you gonna stick around for morning fry cook (how do you spell calastetics?)? SpongeBob: Walking to work, huh Squidward? SpongeBob: Can I walk with you? Frank: I’ll have two Krabby Patties. Frank: Do you, need a break or something? Squidward: (hesitantly) No! It was not me, I swear! (hears fart noise again, fish walks away) Wait, really, I-uh— (walks to kitchen) SpongeBob! (sees him with a mustard bottle, grabs and opens it) It’s empty! (puts it against SB) See, empty! SpongeBob: Wow, Squidward, how’d you know that? Squidward: (leans on grill) Well, let’s see, maybe cuz’, I have a brain. SpongeBob: Oohhh, uh, Squidward, the grill is on. Mr Krabs: Well, you really set him over the edge this time. SpongeBob: Technically, I drove him up the wall. Squidward: (SpongeBob mops) Oh, SpongeBob! I got a present for you. SpongeBob: Wow, Squidward, my very own (confused) Restraining Order? Uh, what is that? Squidward: Perhaps my lawyers should explain. Harry: (fast) We are the law officers of Harry, Combover and Bald, specializing in Restraining Order logical law and here to tell Mr. SquarePants (with Combover and Bald point) You’ve been served! Bald: (pushes Squid away and draws a chalk line) Paragraph 3 in our restraining order, you may not speak to our client. Likewise, you must not go within 15 feet of Mr. Squidward at any time. Any fractions of these behaviors will result in, serious jail time! SpongeBob: Can you make Krabby Patties for loyal Krusty Krab patrons during, serious jail time? Bald: Huh? (Squidward whispers to him) No! SpongeBob: No! I don’t wanna go! Combover: Well then, follow the guidelines explained and you won’t have to. SpongeBob: Uh, sirs, if I can’t speak to, or go within 15 feet of Squidward, how will we get anything done around here? Mr Krabs: (opens door and hits tray) Much bett— (tray hits him) Oops! SpongeBob: Oops! (jumps out window and runs to Krabs) Sorry, Mr Krabs, it’s just so hard to get this food to Squidward without violating this restraining order! Squidward: If I ignore it, maybe it’ll go away. (continues laughing) I thought so. Okay PAtrick, what, what, what!!! Mr Krabs: Patrick, I am not not paying you to stand around like an idiot doing who-knows-what with Squidward. Get back to work! Squidward: Yeah, Patrick, get back to, what! WORK!!! (gets out of boat) Oh, no! No, No, No! (SB backs up) Mr. Krabs! Mr Krabs: Why all the shivering of the timbers, Mr. Squidward? Squidward: Mr Krabs! This will not stand! Mr Krabs: I understand, oh, unless you’d rather talk with SpongeBob. Squidward: Grrr! (cuts to later, fish hands him money, Patrick walks order to SB and walks food back, he hands it to fish) What? Patrick: Can I watch you work? Mr Krabs: Mr Squidward, time for your break. Patrick: I just finished cleaning the restroom! Patrick: I mopped the floors, I shined the mirrors, and scrubbed the sinks! Patrick: Oh, but we’ll need a new toilet plunger (holds up clarinet) this one’s broken. Mr Krabs: Nice work, Patrick. Break time’s over, Squidward. Squidward: Welcome to the house of misery, may I take your order? Fish: Yes, I would like 2 double-fried kelp fritters, 3 Krusty Krab creme filled corals, and 4 triple-fatty Krabby Patties. Is that too much? Patrick: Ha-ha! Squidward’s flying! Hey, a button. SpongeBob: Oh, no, my two best friends are fighting! But this restraining order says I cant get close enough to break it up! (continue to brawl with mustard and spatulas) I’m sorry, restraining order, but my friends need me! (jumps and tumbles, breaks them up) STOP!!! Squidward: (sees order in pocket) Give me that restraining order! Alright, let’s look at this. SpongeBob: Squidward, (grabs his leg) please don’t send me to jail! Patrick: Squidward? (holds up button) Did you know the monster was Squidward? (pause) Well, when were you gonna tell me!? 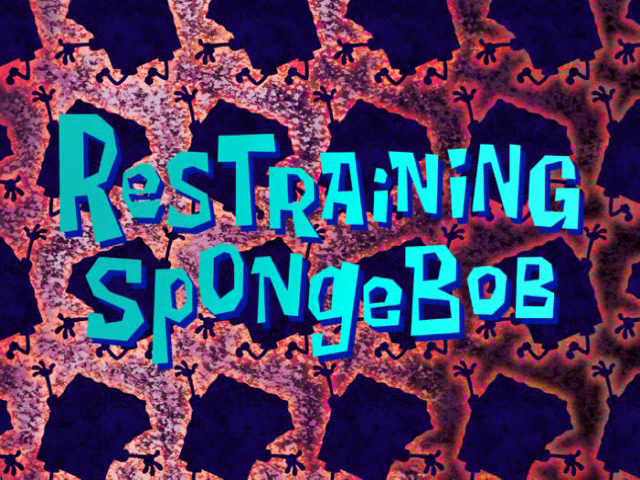 SpongeBob: (cries) I violated the restraining order. I’m sorry, I’m sorry!!! Squidward: Quit blubbering and hand me a pen! Squidward: Stop the waterworks, you are not going to jail! Squidward: No, I am releasing you from this order. Squidward: And adding someone who’s much more deserving!